I would not call myself a deeply religious person. I think a more appropriate adjective would be spiritual. I was brought up in the United Church, and when my children were small, I taught Sunday School. However I never actually associated church, or my faith, with the building or the rites. It was always the community. As my autistic son Eric, at the time still un-diagnosed, became a toddler, I had to stop attending church. I now know that the sensory overload of being in a room or building with extremely high ceilings is almost unbearable for him. As is the sound of an organ playing, or the echoes of peoples' voices as they sing hymns. At the time, however, I just knew that my baby was inconsolable as soon as we entered the church. I couldn't teach Sunday school any longer as he needed my full attention. We couldn't attend the actual service as I had to leave immediately to try to soothe him. No one ever looked down on us. No one ever shunned us. In fact, there were several offers from others to give me a break trying to soothe him. But my monkey could not stand the touch of others, could barely tolerate my touch, so I knew that was not an option. The church community is strong though, and they never forgot us. Even now, two decades later, someone each week invariably approaches my mother or eldest sister to ask about us. Last Christmas, our church, because of declining numbers, had to close its doors. The congregation as a whole moved to a nearby church with a similar ethos. It has been, by all accounts, a happy marriage. But I still have not been able to attend. This year, as a fundraiser for the church, a husband and wife whom I remember from many many years ago when I was still able to attend, asked a good friend of the husband to help out the church. Who is the good friend? Why, a Jolly Ole Elf named Santa Claus. The wife would accompany Santa on visits to homes, (the husband, myseriously, is never there when Santa is, hmmm).Santa would spend an hour or so with the family, read The Night Before Christmas and have a jolly good time for a ridiculously small fee that was then given in its entirety to the church. 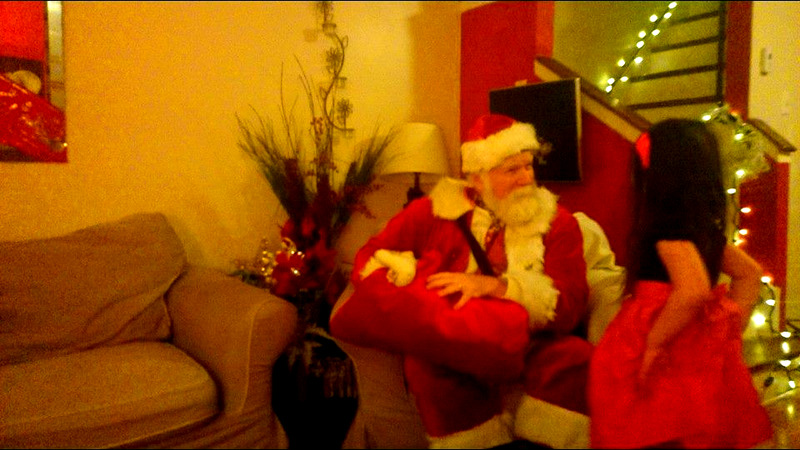 Last night, Santa came to call on us. I had been preparing Eric for the visit for a few days as he doesn't do well with surprise visitors. But I had been telling my four year old granddaughter simply that a very special visitor was coming. Yesterday was a long, long day. My mother, 83 years old, fell a few months back and suffered several broken bones that are still not healed. She is also losing her sight. As is unfortunately typical, many (by all means not all) medical professionals condescend or discount the concerns of elderly women. They only receive adequate care if someone accompanies them. Sad, but all too true. So yesterday started off with me interviewing potential respite workers for Eric, than driving all the way across the city to pick up my Mom and take her to her eye surgeon. She has some new concerns and more specialist appointments were made. We visited the ophthalmologist to get new glasses, picked up Christmas gifts she is unable to get on her own, rushed back to my place to make dinner, showered and dressed Eric than got my granddaughter ready. I am used to living a hectic life, but things have been overwhelming lately and I was feeling stressed. It is often said that autistic people lack emotion or empathy. In truth, it is actually the opposite. They feel it so intensely that they can sometimes shut down in order to shut it out. Eric is quite sensitive to my emotions in particular. The bond a mother has with a newborn never waned between us, it is still as strong as ever. Eric was feeling my anxiety. And he was having a tough night. In the end he needed some medication and deep pressure therapy. He then fell asleep. As the time approached, I woke Eric and brought him downstairs. My granddaughter was bouncing, hyper to the extreme waiting for the surprise guest. Finally, in walked Santa and the better half of the couple that 'know' Santa. It was a wonderful visit. My granddaughter and Santa spent 90 minutes telling each other stories, making up new Christmas caroles, and having a jolly great time. You see, I am a single mom, not able to work a great deal because of my household's needs, so we often go without and things cant get fixed or replaced. When Eric`s anxiety gets too much for him, he sometimes bangs his head or feet on the walls. We have holes in the walls. In short, although our home is filled with love, it is not a lovely home. To add to that, Eric is also not always good even with expected visitors. It is still a change in routine. He can make very loud unexpected noises or bang his head in an effort to ease the extreme anxiety he feels as a result of the change. To the uninitiated this can be disconcerting. But I forgot that this was Santa. Santa didn't see the holes, didn't act as if we were somehow lacking. He deftly managed to figure out that Eric loves the Power Rangers, and brought a bunch of Power Ranger themed gifts. He spoke softly with Eric (most people seem to think that a lack of typical verbal language means you must speak loudly to an autistic person) and he kept his sentences short. He knew that even though Eric was sitting across the room from him, and seemingly not aware of anyone else's existence, that in truth Eric was very aware. Santa didn't flinch when Eric yelled, nor did that stop him from connecting with Eric. 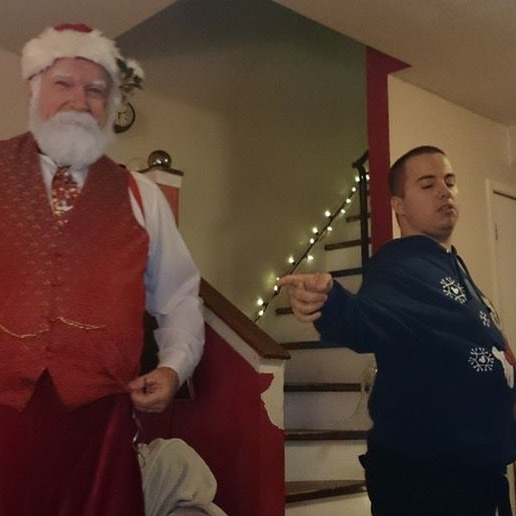 I'm not sure how much experience Santa has with autistic people, I know his friends, the husband and wife, do not have a lot themselves, but Santa (and the lady accompanying him) never once acted, or reacted as if Eric was anything else but Eric. A person. That is not how people typically react to my son. It warmed my heart. When Eric had reached his threshold and wanted to go to bed, he allowed Santa to hug him, something Eric is not fond of and reserves only for very special people. Santa remained for another 75 minutes, entertaining us and in the last few minutes Eric came back down, dressed in pjs, to hang out with us. As Santa left Eric allowed him another hug. A TWO-FER! That is unheard of. My biggest concern with Santa taking time out of his busy schedule and visiting us was that Eric would not comprehend why there were not presents under the tree. Would not comprehend that Christmas was still a week away. 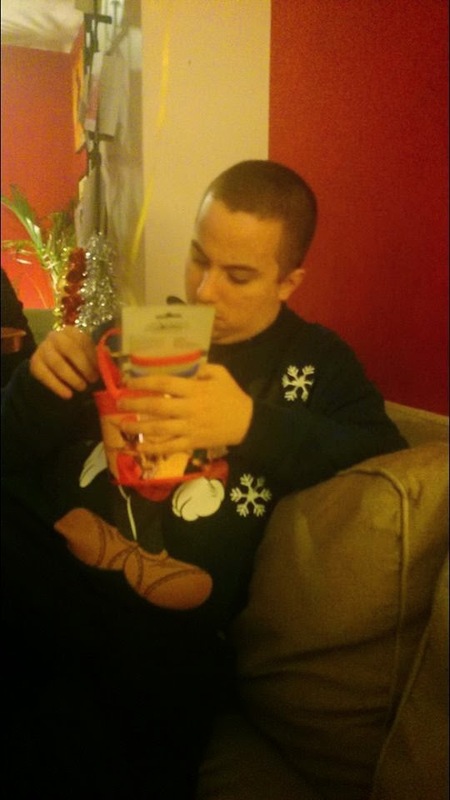 I was worried that when he didn't see his Christmas stocking and gifts that he'd meltdown. And a 21 year old 200+ lb man melting down is not an easy sight to see, or manage. But he didn't. He seemed to grasp that Santa was just visiting. Eric of course asked for more gifts but was OK with being redirected and assured that there would be more gifts on Christmas day. Santa left, I took my Mom home, then got everyone into bed. Eric went to bed immediately and slept peacefully the whole night through, another rarity. That night, as I sat relaxing in my quiet home (EXTREME RARITY!) , sipping a glass of wine and recalling the events of the evening, the tears started to flow. Happy tears. My boys and I have not attended church as a family for two decades. But our church did not forget us. All any Autism Household wants is awareness and acceptance. Santa showed us last night that we have much more than that. We have a community that loves and GETS us. A community that cares about us. A community that doesn't see us as 'that' family, but sees us as THEIR family. 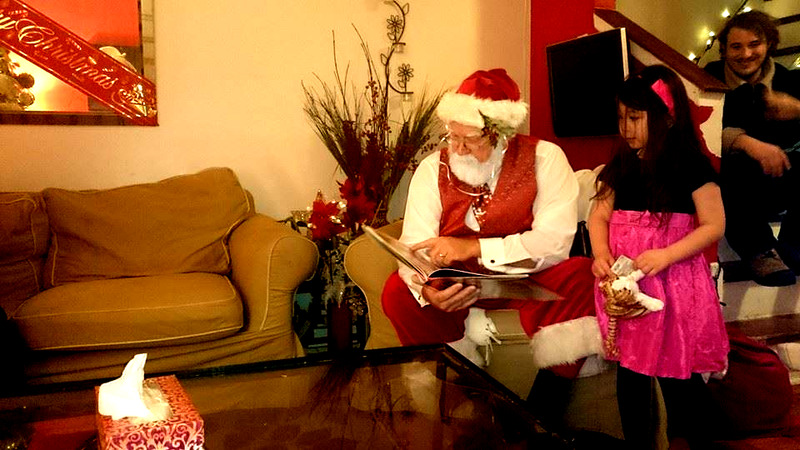 Santa sitting in the armchair reading the Night Before Christmas to my Granddaughter while her father, my eldest son Chris ( who has gust written on this blog) sits on the stairway behind them grinning broadly watching his daughter with Santa. Oddly, the skirt of my granddaughter's dress looks pink, however it is red! I am hoping Santa brings you a big fat check this year so you don't have to worry about any of that silly money stuff. Lol, let's hope, for both of us lol! !